Naha! I noticed on twitter you’d been in London for some reason. Love the fact this is an atypical London skyline (i’ve posted one of those this week too!). Thanks very much! It was taken from the top floor of BBC Broadcasting House – you can see for miles! We were visiting Radio 1! This was taken from BBC Broadcasting House. Hope you had a good visit, there is so much in that skyline. Though it is the eye that really caught my eye and gave me my bearings. Oh yes, the Eye always helps to get your bearings! I’d never thought of that! I always think of it as being very modern, but I come from a small town! I can see you are in London, I hope you are having a great trip, I haven’t been there in a while. Ahh! London! I hope you had a good trip. Thanks very much, I never tire of them either! I love visiting London. Thanks very much. London is a fantastic place to visit, I never tire of it! Hi Sarah, I’m really chuffed that I recognised ‘The Eye’ ( I did, didn’t I?). I’ve only ever been to London for the airports. That is a very busy view. I love the London skyline. I’d never want to live there, but I could look around me for ages. I lived there for a couple of years, but it wasn’t for me! It was only ever a short-term thing. I do love to visit though. Great photo! Hope you had a good trip to London, great view of the skyline! Thanks very much! 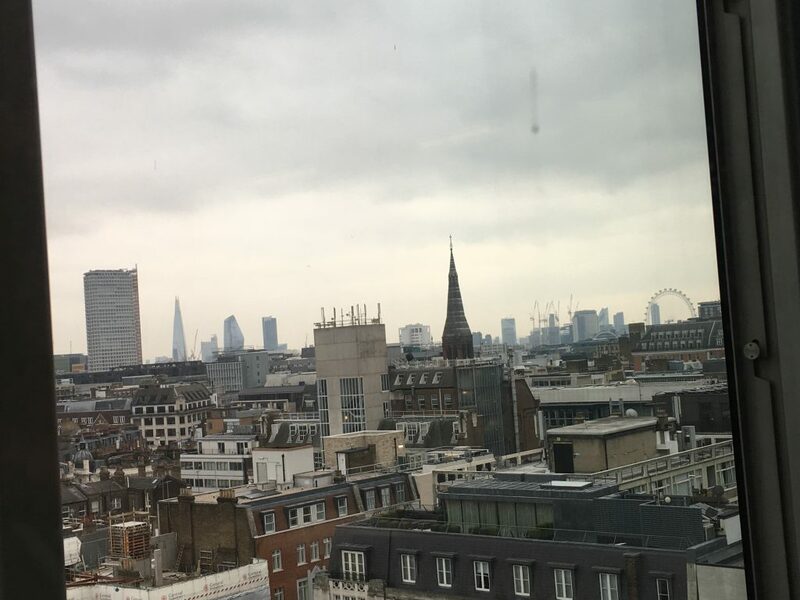 It was taken from Radio 1 – the eighth floor of Broadcasting House and you can see for MILES! What a wonderful view. I had a similar one from Leicester Square a few years ago. Z really wants to visit to see where the great fire of London started! I think all kids want to go to London to see where the great fire of London started! It’s been on the curriculum forever and all kids seem to love it. What a wonderful view of the London skyline and from such an interesting angle. I was trying to work out exactly where you must have been for this view and I wasn’t too far out with the area I had in mind, although I hadn’t guessed it was the view from Broadcasting House. Thanks very much, the views up there are fabulous! There are windows in all directions, so it feels like you can see the whole of London. I’m impressed that you could work out approximately where we were!